Saint Dr. Gurmeet Ram Rahim Singh Ji Insan has been promoting yoga worldwide since 1995 for which he was presented with “Award of Honor” by Yoga Federation of India, Asian Yoga Federation, International Yoga Federation and International Yoga Sports Federation. Yoga is not just a physical exercise of our body, it is a physical, mental, and spiritual practice or discipline which originated in ancient India. Indian government has made the whole world realize its worth, special importance is given to Yoga now. Now whole world celebrates International Yoga Day on 21st June starting from last year, however there are many Yoga Gurus in India who are emphasizing the importance of Yoga from a very long time. Saint Dr. Gurmeet Ram Rahim Singh Ji Insan has been explaining about Indian yoga history and the benefits of yoga in our life, combining yoga with Meditation to show the spiritual importance of Yoga. Guru Ram Rahim has been teaching yoga to students of Shah Satnam Ji Educational Institutions since 1995. Under the guidance of Saint Ram Rahim these Dera Sacha Sauda students were able to participate in International Yoga Championship in 2001 resulting in providing 11 International Yoga champions to India. These champs have represented India 8 times in The World Championship and 5 times in Asian Championship where they begged 61 and 46 medals respectively. These students call Dr. Ram Rahim their Papa Coach, they have made their guru and country proud by gifting about 110 International Medals till date. These students don't have any professional coach, all are trained by spiritual master Saint Ram Rahim. 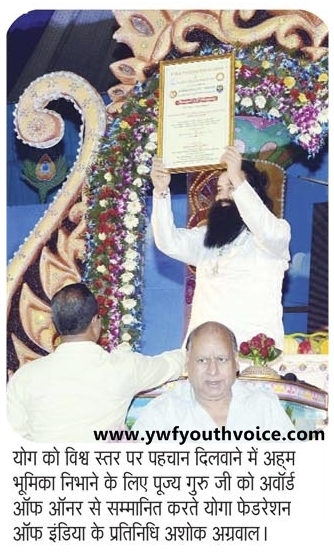 Yoga Coach Saint Dr. Gurmeet Ram Rahim Singh Ji Insan lifting Award Of Honour for his fans. 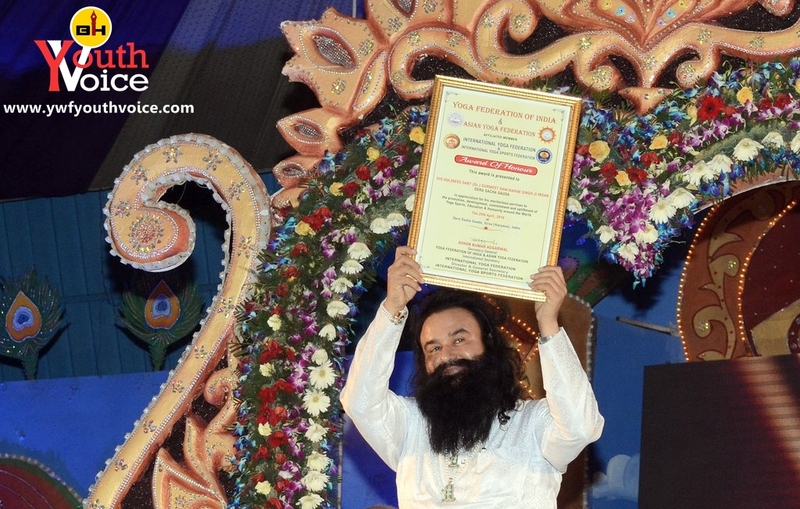 On 29th April 2016, Saint Dr. Gurmeet Ram Rahim Singh Ji Insan was awarded with “Award of Honor” by four biggest Yoga Federations of the world for lifting yoga up to this level, for promoting yoga throughout the country and the world and for creating such gems for the country. According to the Federation officials, Dr. Ram Rahim has played a major role in promoting yoga worldwide through his satsangs, educational institutes, hospital and followers. Video not playing? Click here to watch on YouTube. The Award of Honour was presented by Mr. Ashok Aggarwal, Ex Sports Director of Punjab and Haryana, Secretary International Yoga Federation, General Secretary of Asian Yoga Federation and Yoga Federation of India Mr. Raman (international coach). You may also like to read about other talents of Saint Ram Rahim, click here to know why is known as the Rock-Star Saint.